6.12.13 – In a rut? See how PTC's Bibby Gignilliat found her aha moment. Get your groove back from The Live Well Space here. 6.14.13 – As if this summer wasn't hot enough, the Chicago team dishes on a recent corporate cook-off. Turn up the heat here. 6.18.13 – Colorado loans us one of their own for the summer. Meet our newest marketer here. 6.21.13 – Ever wonder WHY we do what we do? Find out as we break down our Kitchen Challenge event here. 7.3.13 – Feeling melon-choly after the 4th of July? Try this unique gazpacho recipe! Snap back into summer here. "I knew it would be perfect for a team building event. The best part was the excitement of cooking with mystery ingredients and the competitive spirit it brought out in everyone." "It was really fun, perfect for our group size, and priced reasonably. There were a lot of great things about our event: the easy instructions, great atmosphere and people." “Going into the event my group told me they weren't skilled in the kitchen. You gave them the confidence to do something out of their comfort zone. We typically go to dinner as a group, but only sit there. This allowed us to move around and interact with everyone." Some of you may have attended our recent Appreciation party where we unveiled a new “reception-style” event format – part cooking, part demo, part mingling, all delicious. It was such a hit, this passport event is now available for your next large corporate function. At Taste & Technique, guests participate in a series of interactive food stations, earning passport stamps as they go. Perfect for company-wide summer celebrations, networking receptions, client appreciation and holiday parties. Inquire now! Our summer Tamale recipe is a guaranteed crowd-pleaser. With Black Beans and Jack Cheese, this is one vegetarian recipe that will not disappoint. Pro Tip: These tasty tamales are best enjoyed on a sunny day while you sip on a Corona or your favorite tequila. No, you won't find red bell peppers in our tamale recipe. What you will find is that roasting Anaheim chiles requires the exact same process! Pyros beware: It's easy to have too much fun with this open flame cooking tip. 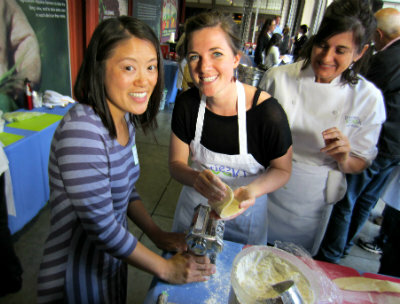 Classes are fun for beginners, foodies, and those looking to make friends. Present friends, family, or even employees with a cooking class gift certificate that they can redeem anytime throughout the year!